Time changes everything. People change, emotions change. Perceptions change. Mistakes happen, lessons get learnt. Sometimes we heal fast, and sometimes we don't at all. When you finally feel the wound healing, the dry skin gets peeled, reminding you of the wound and the hurt. That is when you'll realize the sweet truths. We'll judge, we'll get judged. We'll take sides, we'll be taken side of. Everybody will know their bit of the story, but the puzzle will never be complete. And sometimes, there are far too many pieces than required. At the end of the day, an uneasiness remains, like a ghostly remain of the past that died, the past that bled to death and is in grave now. It is up to us, whether we try to complete the broken puzzle or start a new one. For somebody was right when they said - 'People are so unhappy because they look at the past being happier than it actually was, and the future being scarier than it actually is'. 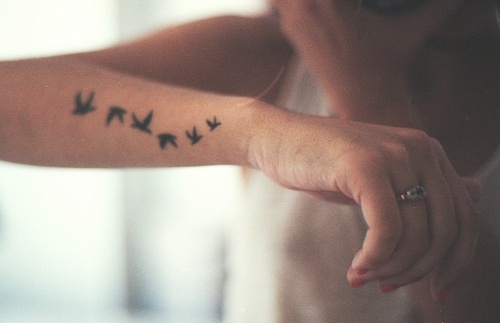 PS: This picture that I found on We Heart It, and the birds made me feel the freedom. And the struggle behind freeing yourself and liberating yourself - with the sweet truths.